All branches from the Canberra / Queanbeyan region participated in the demonstrations over the three days of the show. "No Parking", "No Parking", "No Parking" had sprung up out of the ground like a field of mushrooms. These words meant what they shouted, as some car owners would find out when they returned to their mode of transport. This would make their show visit extra expensive. In the old days one could park in these suburban streets of Watson, adjacent to Exhibition Park In Canberra, cross Northbourne Avenue and be at the gate in four minutes flat. Now cars are getting pushed further away and the walk longer. It did turn out, however, that we were closer than those people that had parked in the official parking areas. Anyway, we found a ticket-free park, piled out of the car, grabbed our bags, backpacks, drink cooler and what not, and headed off to the rendezvous point. The ten-minute walk with the ankle biters would do us good; it would give us time to enjoy the chilly, windy weather. Yeah! Sure! Guess who had left a jacket at home and was clad in a t-shirt with Japanese writing on it? The meeting time was Saturday 12:30pm and the smells of food cooked in oil flooded the senses, setting off a reaction in the food processing area of the body. Looking through the magic arch that led into wonderland, (I wonder what is in there and I wonder how much it is going to cost?) there it was, bumper-to-bumper people. Music mixed with music, sounds of machinery and people; transported back in time, ten years old again - well for a while anyway. Quite a bit of time had passed since the last visit to this world of hedonism and yet, for a few seconds, standing there it once again totally engulfed the consciousness, then reality whacked in and our group entered. Rock climbing to the right, paint ball to the left, the ABC truck straight ahead and here we were stuck in the middle of the square with fun things to do all around. We were outside in a bitumen car park with only a small stall for shelter and storage. The mats were looking up at the sky and many a shoe had left an imprint on the plastic covers. 1:00pm. 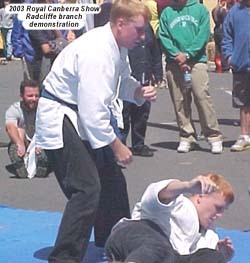 The white judogis gathered around the mat and knelt down before the onlookers. "Welcome to a demonstration by the...", it was off and running. Exercises, punching, kicking, rolls, breakfalls, techniques and two-man attack were explained and flowed without much hesitation. A roar of approval expelled from the crowd, loud enough to cancel out any other intrusion. 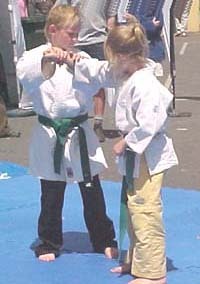 The two-man attack was in full swing when the female blue belt defender executed a kick. This gave the 7th Dan black belt a reminder that four children of his own were more than enough and that he did not need any more. He did not go down but later revealed that it was a bit harder than a tickle when it connected. Why are women so unkind? 2:15pm. The crowd was warming to another round of what could be expected on a normal training night when, just as the kicking exercise was about to commence, "Bob the builder, can we fix it..." rang out and echoed across the mats. All other sound was lost. In the ABC van one could sing along with Bob, have it recorded and take the tape home. It was at this very moment that somebody in the van had switched the sound to the outside speakers at full volume. Everyone on the mat just froze in a natural stance until we became hearing-endowed again. Even the crowd seemed not to move - they just covered their ears. 5:00pm. A white glow emanated from near the centre of the mat. Was somebody transporting onto the mat? No. 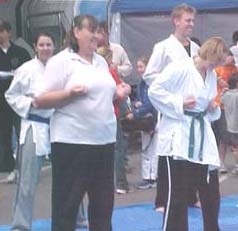 A 6th Dan black belt from St Edmunds had stripped to the waist to demonstrate some pressure points of the body. The glow was from his Canberra suntan. The pressure point demo went off quite well, as anything that inflicts pain is always a hit with the audience. To add amusement, the demo was presented in a comical way with an underlying theme of "putting junior to bed when he does not want to go". In between demos, the participants would talk to passers-by and hand out flyers. At times, things got a bit slow then all of a sudden the stall would be clear of males. This happened a few times. What was going on? Ah! There they were, handing out flyers, deep in conversation for some time. But why were there so many around one or two people? The answer appeared, as the people moved on - the boys just happened to be conversing with some young lassies of teenage years dressed in very warm weather attire. Boys in uniform! At some stage, while flyers were being handed out, two young Japanese women showed an interest in our academy. After a long discussion, our 6th Dan from St Edmunds was seconded to have his photo taken with them. He is now an international star as his photo is now in the land of the rising sun. Eventually the body grew tired, the daylight gave in to late afternoon and the curious went in other directions. It was time to do the last bow of the day, pack up and head off back to our own worlds. The academy made a lot of contact and got a lot of exposure over the three-day weekend. There are people out there that now know who we are and what we are about. Even if the academy does not get many new students - is that such a bad thing as a bit more of us has been passed on?